For architectural sticky-beaks Architecture for Sale lists residences (primarily in the US) designed by architects just waiting for you to put down a lazy million… or four. There are some notable houses featured including (at the time of writing) the masterful Esherick House by Louis Kahn, the Desert Nomad House by Rick Joy (a steal at US$875,000) and Craig Ellwood’s Broughton House built in 1949. My pick: The Millard House (aka La Miniatura, 1923) by FLLW. A sublime residence and gardens for only US$4.4 million! If you really are interested, delve into the real estate details, including the previous sale prices. Ingenhoven prefaced his keynote by stating that he believes architecture is about surviving and not fashion and so by extension in order to survive the buildings must be energy efficient. 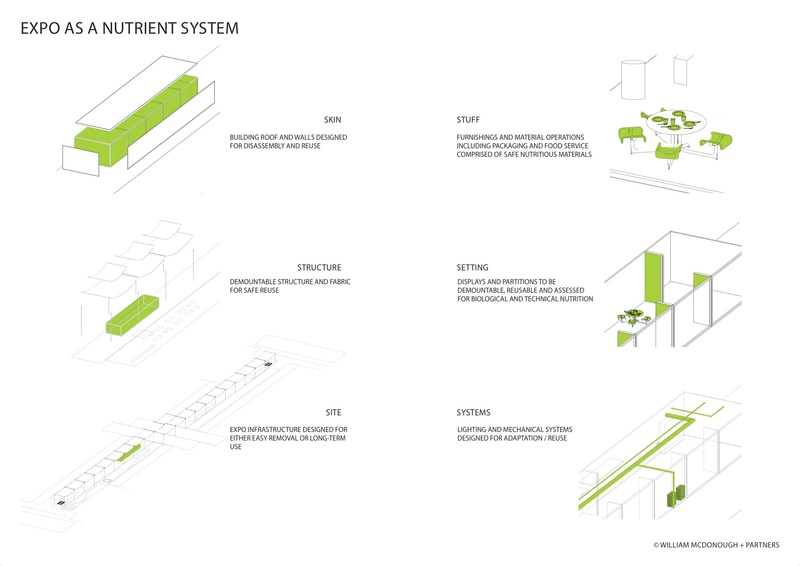 So it’s no surprise that he seeks paired down structural systems, integrates landscape elements and assesses all projects against his own environmental criteria. Many of the projects by Ingenhoven Architects presented are rational solutions that employ double skin facades, geothermal, wind, solar and passive energy principles such as natural ventilation and day lighting. Some achieve zero CO² emissions (the Dusseldorf House) and others find the optimum factor between surface and volume (the circular RWE AG Tower in Essen) to minimise material and energy wastage. 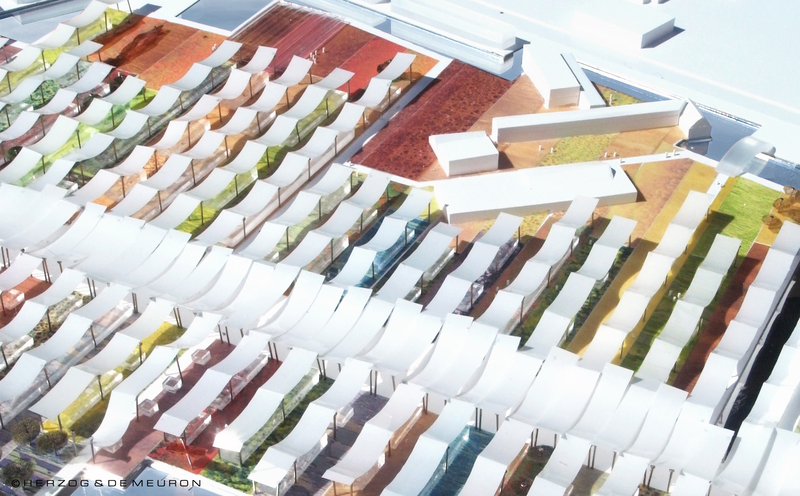 A group of projects Ingenhoven presented, that could be called the “Atria Projects”, all included a variety of atriums to act as a natural buffer between external and internal spaces. Not only do these atrias provide environmental benefits by filtering air but are also internal landscape spaces for people to view and enjoy away from the climatic extremes. The planning of these large commercial projects is based on a “village concept”, according to Ingenhoven, and the Lufthansa Aviation Centre, 1 Bligh Street (Dexus) Tower and the European Investment Bank (winner of the 2010 Emilio Ambasz Prize for Green Architecture) all take different approaches. The tower in Sydney (designed in association with Architectus) is a vertical version of the other two horizontal schemes and is an elliptical plan with a core pushed to the rear (south) of the site away from the views and best aspect. A circulation path takes you around the centre of the floor plate and creates a feeling of community as the lifts open onto the atrium. In this case, a night purge system utilises the atrium and a blackwater (sewer) system is used in cooling water for the air conditioning as only 50% natural ventilation is provided – excellent for a tower in Sydney though! A project that stood out from the others presented was the Stuttgart Station project. With a 20 year period for realisation, the project provides the missing link in the European high-speed rail network and is the most structurally expressive of Ingenhoven’s projects – probably due in part to his collaboration with Frei Otto. The station structure is a pressure-loaded cone structure with a ring beam that morphs the columns and roof into one element. These elements are like giant eyes that provide natural day lighting and ventilation. Ingenhoven claimed the project did not emit any CO² (part of the ‘zero energy’ target) but the most impressive aspect was the concept of harnessing the (sucking) airstream from the trains to naturally ventilate the station platforms and maintain an operational temperature of between 14-27ºC. With a typical rationalist approach, Ingenhoven stated that form and design elements of his projects are not predetermined but the result of technical investigations and testing. Not sure if that’s truly the case but for me the synthesis of environmental, structural and architectural elements in Stuttgart Station project transcended this rigid process. Main Station Stuttgart Project Booklet (PDF) for the 2006 Global Holcim Awards. A detailed outline of the station design and systems. 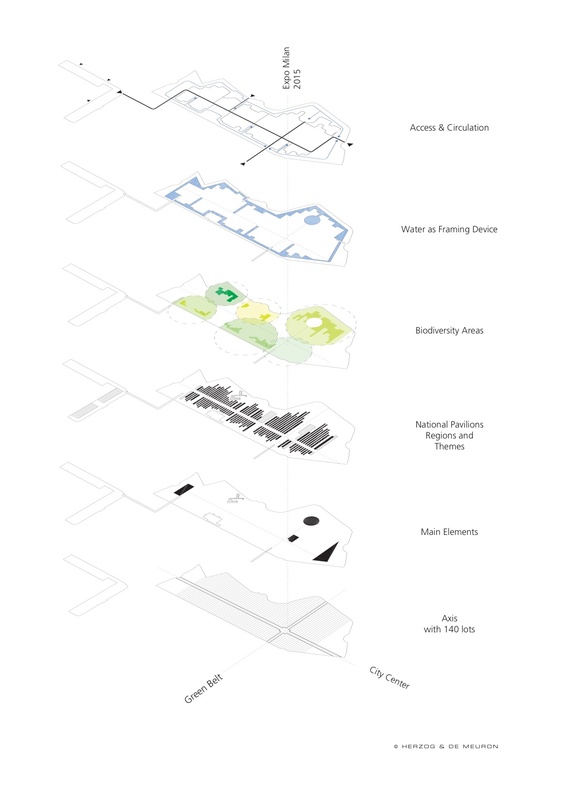 Joining a long line of notable architectural designs emerging from previous Expos and World Fairs, Herzog & de Meuron today released their concept design master plan for the Expo Milan 2015. Described by the architects as a “reinterpreted urban agricultural landscape” the design reminds me of the classic Italian gardens analysed in the book “Green Architecture & The Agrarian Garden” (Barbara Stauffacher Solomon, 1988) that made such an impact on me when I studied landscape architecture. At first glance, the scheme looks like it could be for an anonymous new city in the Middle East but on closer inspection it reflects some romantic elements of Italian cities – Venetian canals and picturesque agrarian scenes in Tuscany – that sit within a rigourous urban structure. The design is organised around a 1.4 kilometre long boulevard about the scale of the Ramblas in Barcelona or parts of the Champs Elysées in Paris. In the tradition of Roman cities, this primary axis intersects a secondary boulevard that connects the Expo site to the city fabric. A series of strips (perhaps recalling furrows in a field) covered by shade sails cut across the boulevard axis and define the building sites for all the national pavilions. By arranging these strips perpendicular to the axis, each country has an equal frontage or representation at the Expo – despite the varying lengths and topography. Water frames the site in way that recalls the waterways of Venice (check out the boats! 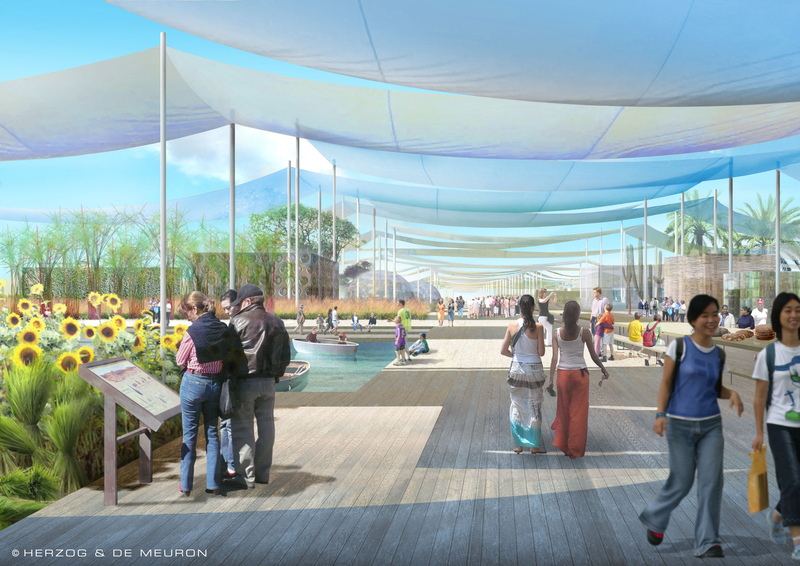 ), provides sustainability benefits (in part a constructed wetland) as well as way to move around the Expo by boat. 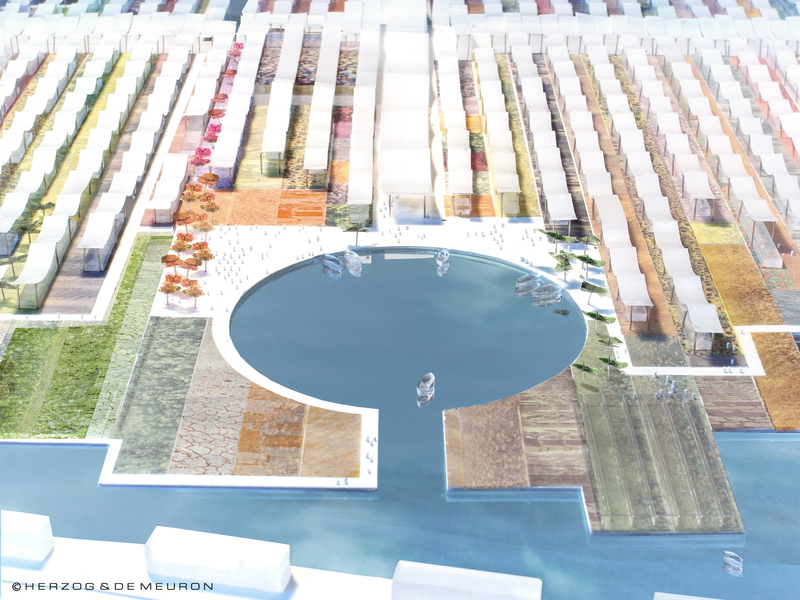 Given the strong green theme of the Expo, Herzog & de Meuron are working with the world-renowned sustainability leaders William McDonough + Partners to develop a range of environmental processes that are guided by McDonough’s “cradle to cradle” approach. The diagram below highlights the different parts of the “nutrient system” whereby an appropriate cradle to cradle cycle is assigned to each component; Stuff (1 day to 1 month), Setting (3-30 years), Systems (7-15 years), Skin (20 years), Structure (30-300 years) and Site (eternal). 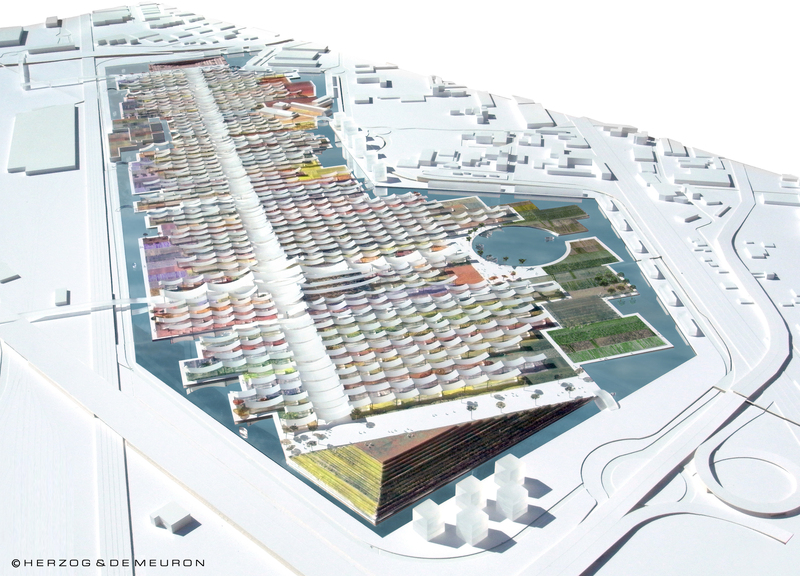 Interestingly, Herzog & de Meuron’s bold concept for the 2015 Expo is not exactly their first. In fact, the origins of their de Young Museum (2005) in San Francisco stem from the California Midwinter International Exposition of 1894 as the original building was severely damaged by a 1989 earthquake. 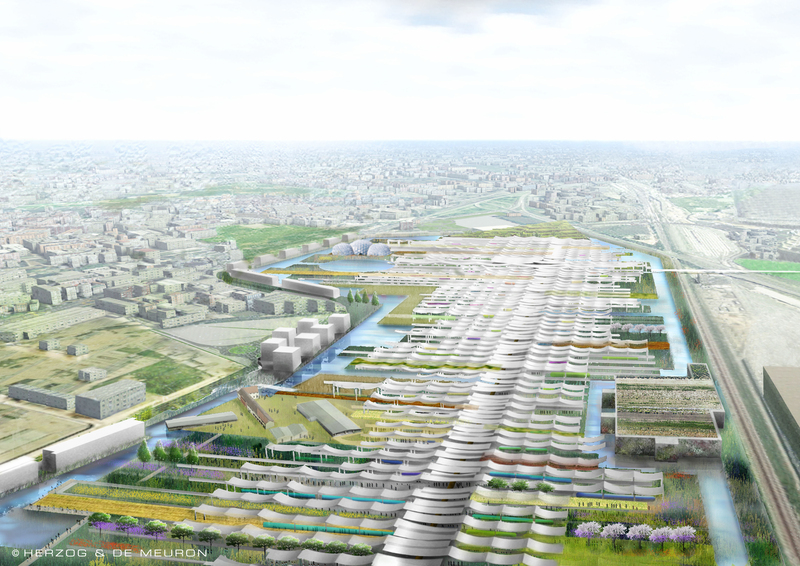 UPDATE 12 April 2015: As the Milan Expo is now only a few weeks from opening, it seems timely to update this 2009 article. 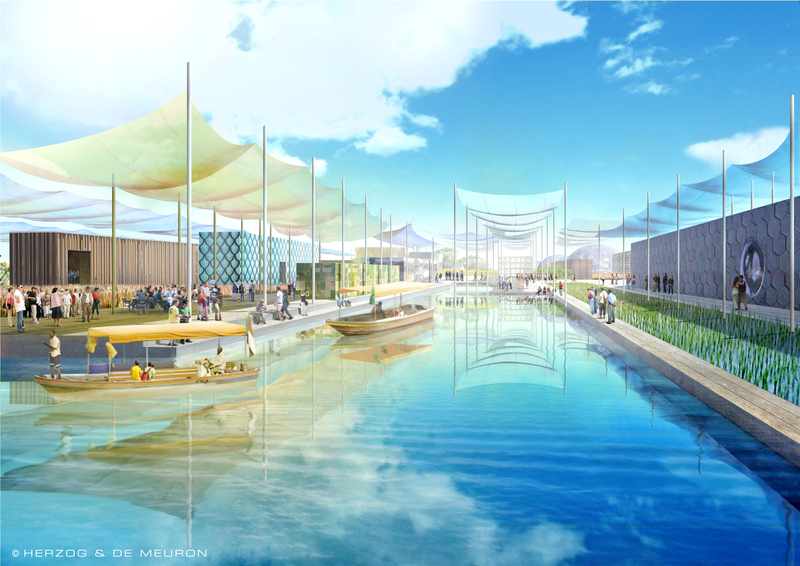 Regrettably the “lofty aspirations” of the design team for Expo Milano 2015 remain that – aspirational. By 2011 the entire master plan team of Herzog & de Meuron, Stefano Boeri, William McDonough and Ricky Burdett left the project. Turns out that the organisers weren’t ready to accept the radical new vision of focussing on the issues and content rather than individual pavilions. Go and read the full interview with Herzog in issue no. 32 of uncube. It’s well worth your time.